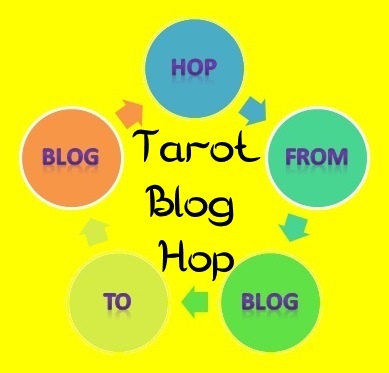 Welcome to the Yule Tarot Blog Hop--gee where has the year gone? The theme for this TBH is "cozy." Or as I like to call it, "Another chance for Morgan to talk about how he wants to remodel the house." In this particular case, how I would like to set up my upstairs ritual/oracle room. When me and my wife first brought the house, the second bedroom was to become my office with the half-basement being a ritual room. Having lived in the house for sixteen years, and having more ritual and fortune telling under my belt, along with the lingering effects of my wife's motorcycle accident, using the downstairs for ritual is not as practical as it used to be. So it is time for changes. ...and the upstairs room is going to become a shared ritual and mediation room instead. Like my yard (which has been the subject for several of this year's Tarot Blog Hop entries), the vision for the ritual room is based on my vast amount of social witchcraft and magical experience. As some of my friends can guess, some of my ideas come from working with Cassandra and my time taking classes over at Herbs and Arts (when it was still owned by Morning Glory) as well as vast amounts of personal practical experience. One of the things I have learned is that my magic and Tarot/oracle reading is affected by the atmosphere of the location that I am working in. I have done the public reading route, both in occult shops (up front, in the back room, have yet to do a reading on the roof of one, but it is only a matter of time...) and in coffee houses (that is why many of my Tarot decks have spilled tea on them) and at parties (let's call it being "entertainment"). And I have learned that public reading is just one step away from working in a cubicle, or a boiler room (hey, I seriously explored working for someone with a 1-800 number). No, the best environment for me to do reading is lit with candles, private and smells of vast amounts of incense. Think "gypsy tent." Laugh if you will, but I think that they were onto something. ...so, why not make my wife happy? Besides, I need to get back into the swing of my magical work. As such, my wife and I have talked about what we would like to do with the room. My vision tends to be a little more grand (as in "What would I do if I had a boatload of ill-gotten gains from a wildly successful book?") while my wife is more realistic. For instance, I would like to have a fireplace in the room, but that would require a bunch of cash and the hiring of people who actually know how to do the work. There are those fake fireplace heaters, but it is not the same. Something that my wife mentioned when I told her about the subject of this Blog Hop is that she would like a corner full of comfy pillows. So, the room is going to have a big pile of soft (and probably tasteful) pillows. And many, many gods and goddesses; it is an artist's house after all. 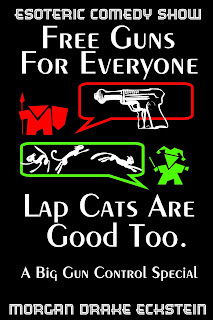 And cats! Many, many cats. The cats will probably vote that the pile of pillows belong to them. Of course, all this requires me to clean out the room (it ended up being used for storage, due to the lack of enough bookcases in the house--a DIY project that has been delayed while I work on the novel--thirty thousand words and counting...) and then getting out of my wife's way. It is totally do-able. After all, I am now on bipolar meds, and can cope with the project. 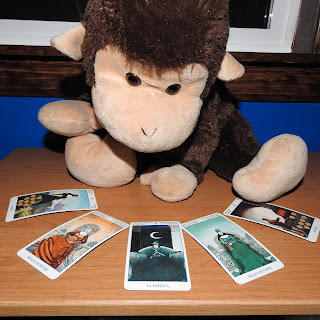 Tarot Blog Hop--all about the Tarot. Thanks for reading my TBH entry. As always, you are encouraged to follow the links and read the other entries for this theme--there is always something new to learn. Have a happy Yule and a great 2019. I like hearing about your renovations and remodeling. I'm struggling with not having enough room for ritual space. Sounds like your plan is coming together! I have a small tuxedo tabby who thinks Anubis is a genius. Readings with candles and incense, and a specially designed ritual room--your post is inspiring me to do some different things with my own house. Thank you! I Love that your cat is named Anubis. I also love the idea of an actual ritual room. I am actually thinking of cleaning out my walk in closet to create a ritual room so I can have total darkness when I want it. I always love reading your posts, Morgan. You create all kinds of smiles and chuckles on the way. And you've gotten me to thinking about a more dedicated ritual space myself. Currently using my office/spare bedroom, but there is another alcove up here in the attic that might do as well. And in the summer, maybe an outdoor space! That's an idea! Thanks for both the humor and the inspiration!